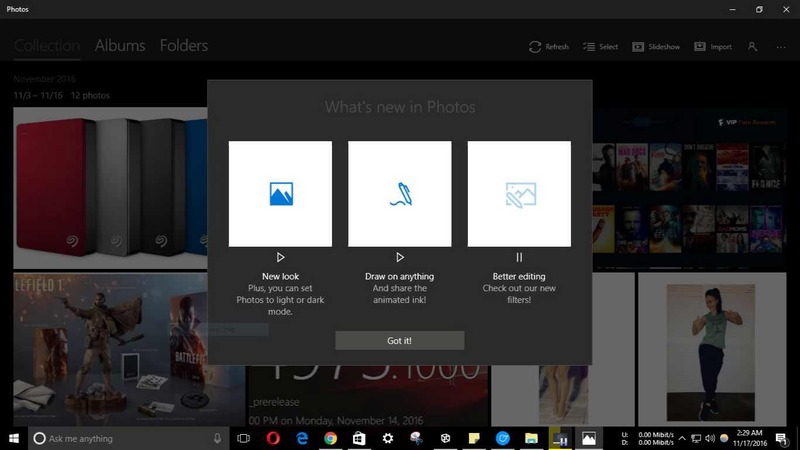 Microsoft has released major Photos app update version 16.1111.1000 for Windows 10 users. Photos app update brings new update app interface, ink support and more. The latest update replaced the hamburger button with menu Collection, Albums, and Folders. The new app also includes new animations for Windows 10 PCs. The new Photos app includes Microsoft’s Segoe UI font. The Photo app now supports new draw on anything feature and new filters. With the draw feature, touch enables devices with pen support, can draw on the photos for notes or just fun. Users can also save the image with the animated ink. Now there are new options for marker, pen, pencil and various colors. No hamburger menu for PC as it is all pivots now. New animation: When photos are minimized there is a new animation. Albums are appropriately sized and formatted to show more information. Draw on anything and share the animated ink. Better editing with new filters.